Our Garage floor coatings feature an excellent color and gloss retention and are available in a wide variety of colors. Our garage floors offer a unique coating system technology that is UV resistant as well as impact and abrasion resistant. Garage floor coating that is 4x stronger than epoxy, takes only 1 day to apply, and will not yellow, fade or chalk. The slip resistance of Slide-Lok garage floors can be tailored to your precise needs with the addition of micro media agents. In addition, our Garage floors provide excellent adhesion to concrete and do not require a separate or special primer. Also great floor coating for your patios, side-walks, warehouse, foyers, restaurant floors, courtyards, basements, and showrooms. 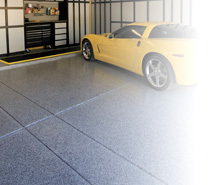 Our garage flooring techniques utilize a new generation of fast-curing material. Our garage floors can be applied at temperatures as low as: -20°F/-29°C. By using polyaspartic we are able to install today and you can drive on it tomorrow. After installation you can walk on within 4 hours, and drive on in 24 hours. We manufacture our own chemicals and pass the savings on to you! Slide-Lok's the name to trust.